Tyra introduces the show and announces that Circus 1903 will perform tonight. Clips from last night’s performances are then shown. Twelve acts take the stage but five will be sent home before the night is over. 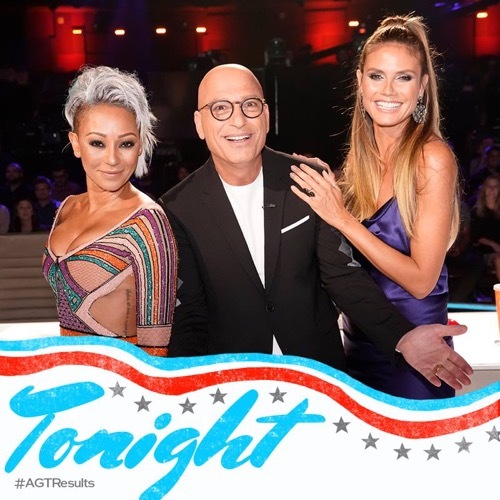 Tyra and the judges agree that last night was a crazy night from an acts trick failing to the fight between Mel and Simon it was chaos all evening. They all hope tonight’s show is much smoother. Tyra announces that only one of the three performers she will call to the front of the stage can be saved by the live Dunkin Save vote. The acts are Eric Jones, Evie Claire and The Masqueraders. Tyra encourages the home audience to vote during the next 30 minutes before the polls close. Howie is heartbroken because he thinks all three acts deserve to move on to the next phase of the competition. Tyra is back stage with the three acts in jeopardy as they watch clips from last night’s back stage antics. Tyra announces the first results of the evening. She calls both Brobots & Mandroids and Light Balance to the front of the stage. America has voted to keep Light Balance and send Brobots & Mandroids home. Light Balance will move on to the semi-finals. The next results are in and Tyra calls Mandy Harvey and the Pompeo Family to the front of the stage. The voters have decided to send Mandy Harvey on to compete in the semi-finals. She is in tears as the Pompeo Family is sent home. Simon is very happy because Mandy was his Golden Buzzer. Tyra again tells viewers to vote live now to decide which act will go home. Will it be Eric Jones, Evie Claire or The Masqueraders. Tyra asks Evie how she is feeling right now and she admits she is very nervous while the Masqueraders are quite anxious but ask America to use the Dunkin Save to keep them in the competition. Circus 1903 performs several amazing circus tricks as the audience and judges watch in amazement. The next results are announced as Tyra asks Johnny Manuel and Damian Aditya to please step forward. Johnny Manuel will be moving on to the semi-finals and Damian is sent home. No one is surprises as Damian’s trip failed the night before. Howie is thrilled because he thought Johnny hit it out of the park last night. He encourages Johnny to take Simon’s advice from last night. Merrick Hanna, Mirror Image and Celine Tan are the remaining three acts on the stage. Tyra wishes them all good luck and announces that America has voted Celine Tam on to the semi-finals. Tyra congratulates Celine but tells Mirror Image and Merrick to stay on stage as she is not done with them yet. Heidi knew Celine would move on as she is an amazing 9 year old girl. Tyra then turns to Mirror Image and Merrick Hanna to report that Merrick will be move forward to the next round of competition. He is so excited but also a little sad that some of his friends will be going home. Tyra tells the viewers that the winner of the show will be performing live on stage November 3rd and 4th at the Planet Hollywood Resort and Casino in Las Vegas. There are still two spots open for the semi-finals but three acts left. Eric Jones, Evie Claire and The Masqueraders take the stage. The act saved by the home voters tonight is Evie Claire. Now it is up to the judges to decide the final act to remain. Heidi loved both acts last night but has to give the Masqueraders her vote. Mel also agrees both acts were great but votes for Eric. Simon liked both acts but has to vote for the Masqueraders. Howie thinks this decision is so hard but ultimately votes for Eric. Tyra goes to the votes from American and announces that Eric Jones is the winner and will move on. Tonight it has been decided that Evie Claire, Merrick Hanna, Celine Tam, Johnny Manual, Mandy Harvey, Light Balance and Eric Jones will move on to the next round of the competition.